Fees are $35 a day. The daycare is open Monday through Friday, 7:30am to 5:30pm. Note: $35 a day times the number of school days that month. Fees can be paid ahead by the month, two weeks in advance or one week in advance. We give a yearly video to parents showing their child singing holiday songs, as well as pictures taken throughout the year. We produce the video and set it to music. It has become a tradition that is treasured by parents and grandparents! We have a yearly pretend camp-out! The children love this adventure! 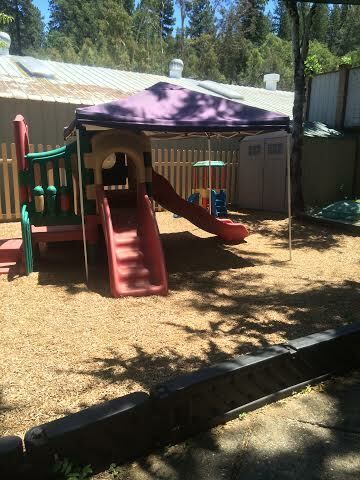 All adventures are had in the professional fenced play yard. The El Dorado County Library visits us! They read to the children and leave a book for the daycare to keep! We are on the USDA food program with Choices for Children. Our mac n cheese is homemade with three cheeses! The beans in our burritos are homemade in the crock pot! Fresh fruit and vegetables are served daily! We offer yearly eye screening by the Elks of Hawaii and California! We have a month-long curriculum about the rainforest!